November 16, 2017 By Chelsea T.
With billions of dollars spent on the Halloween Season throughout the U.S., candy is one of the things people spent the most on this year. For those who didn't feel like going to the store to purchase their candy, they did what any smart shopper would do - purchased it on Amazon. According to Confectionery News, the popular Hershey's chocolate candy bar took the largest share of Amazon's candy purchases in October this year, compared to other popular candies, including Airheads, Sour Patch Kids, Starburst and Skittles. Edison Trends, a source for the most current e-commerce trends in the United States, stated that the analysis "did not take into account mixed bags and their contents." This would include purchases like "Party Mix" and "Halloween Mix." One Click Retail collected data that stated Amazon US alone raked in $13 million worth of candy during the Halloween Season. 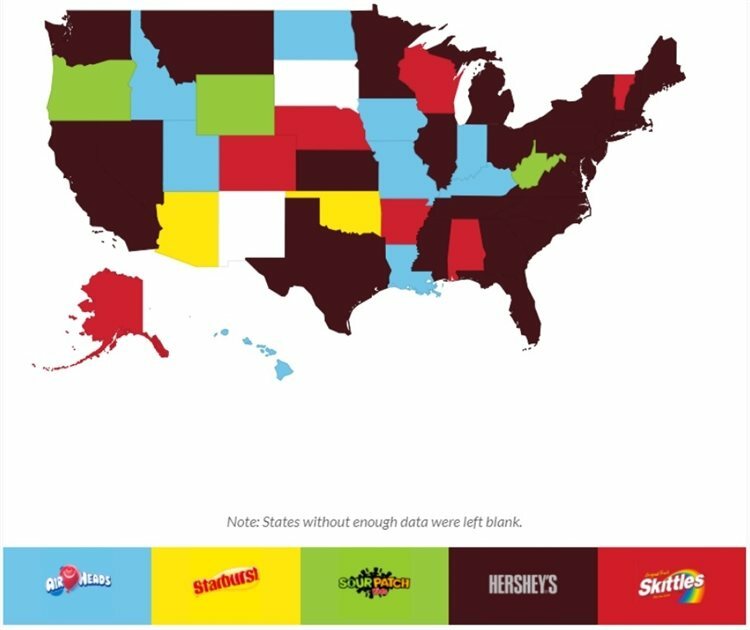 Check out the map below, thanks to Edison Trends, which shows the highest Amazon Halloween Candy purchases for 2017.